Kinekt Design has just released the perfect auto and technical enthusiasts’ gifts for the holidays. 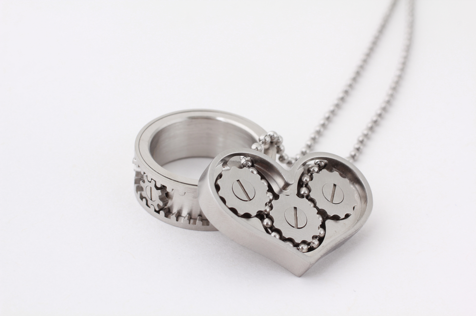 Kinekt Design introduces the Gear Necklace, featuring a working Heart-Shaped Necklace with Working Gears. I received mine and was so impressed with the quality. I had purchased the ring a few years ago and still wear it quite often. The quality is what separates these unique gifts from ordinary. The new heart shaped necklace was conceived as a complement to the Gear Ring; the Gear Necklace also features interactive play in jewelry. The pendant consists of three gears encased in a stainless steel heart. Sliding the pendant along its ball chain or pulling gently on the chain will set the gears in motion. The Gear Necklace represents a collaboration between three siblings who sought to design a piece of jewelry that tugs on one’s heartstrings. “As co-designers, the Gear Necklace remains really close to our own hearts. It just happens to have three gears working together which perfectly symbolizes our team work,” says Rachel, about the experience of working with her brother and sister. The Gear Necklace is available in three lengths of 18, 20, and 30 inches. A video demonstrating the necklace in motion can be viewed here: http://youtu.be/vcdMZrmdwKU. It will not bend or break and it is hypoallergenic for those with metal allergies. Sold exclusively online at kinektdesign.com, the purchase price of $185 includes worldwide shipping and comes with a lifetime warranty. The purchase price includes the lifetime warranty and worldwide shipping/handling. There are no surprise fees or costs during the checkout process. To place an order, you can either purchase directly from our website – www.kinektdesign.com or call us toll free at 1-888-600-8494. The website and toll-free number are both accessible 24/7. For questions, comments, exchanges, or refunds, email hello@kinetkdesign.com.